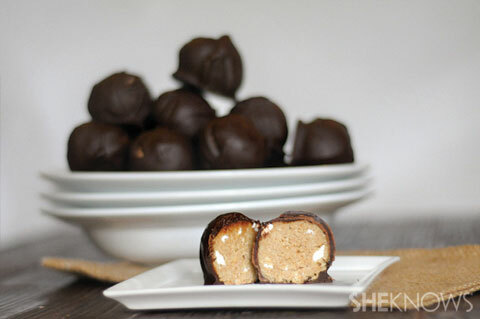 S'mores truffles are packed with s'mores goodness in a tiny bite, making it easy to clean up and control portions! Graham crackers are mixed with cream cheese and marshmallow bits and then covered in milk chocolate for a treat everyone will love! In a food processor, pulse the graham crackers until finely ground. Add the cream cheese and process until the cream cheese and graham cracker crumbs are fully combined. Add the marshmallows and pulse until the marshmallows are evenly chopped and evenly distributed throughout the mixture. It will create a ball in the processor when it is done. Scoop the dough out by the tablespoonful and roll into balls. Melt the chocolate chips and coconut oil together over a double boiler until completely melted and combined. Remove from heat and allow to cool for about 10 minutes. To coat the truffles, dip them in the chocolate and roll around to cover. Remove from the chocolate and place on a baking sheet lined with foil or parchment paper for easy removal later. Repeat until all of the balls are covered in chocolate. Refrigerate for about 30 minutes to allow chocolate to harden. It is best to keep these cold until ready to serve.